JusVon grew up in the city of Watts where he began playing drums at the age of 3. He continued this gift by playing in church and at age 14 he had his first professional studio experience with Taj-Mahal. From that experience, he went on to play with Blues legends such as ZZ Hill, Smokey Wilson, Lee Shot Williams, Artie White, Tyrone Davis, Brenton Wood, Sun Seals, The Drifters, Percy Sledge, The Platters, Walter Cook and The Sweet Singing Cavaliers and many more. He has toured internationally with Otis Clay and Zora Young. While on tour, JusVon performed background music for television shows in Europe and Japan. JusVon is now a highly sought after Blues vocalist preparing for a national tour. His vocal influences are a cross between Otis Redding, Buddy Ace and Wilson Pickett. Just as these Artist had experienced, so are the many experiences that JusVon has encountered in his life and he just wants to share his passion with the World. JusVon is a recording artist for Parliament Records, working side by side with Mr. Benny and Lenny Weisman, writers/producers for Parliament Records. JusVon has plans to continue his writing and co-writing songs with/for some of the worlds leading producers and vocalists. 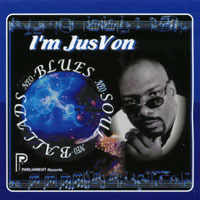 His current album "I'm JusVon" consists of original songs and songs that were made famous by the late Buddy Ace. His live performances are always well received by audiences everywhere, due to the relative contents of his lyrics. He has something that everyone can relate to. Don't sleep on this artist, he truly has a story to tell. The powerful instrumental and vocal arrangements are exciting and full of surprise! JusVon stamps his signature on the tracks in a seasoned, self-assured, world-weary voice that shines forth like crystal. At times he can be mellow and smooth in the voice of Junior Parker; gritty and spontaneous as the voice of Wilson Pickett; and as warm and paternal as the voice of Solomon Burke. Jusvon you sound better than ever keep up the good work. This is without a doubt one of the best Blues & Soul performances around today, I'm proud and happy for the young man Jusvon for his continued hard work and soulful expressions. You are a diamond in the rough.